It’s April and all my does have kidded for the season. What a relief!! This picture shows some of my Alpine babies. I plan to have does (female goats) kid (have their babies) during April when the weather is a bit more congenial. I teach long hours every day at a Catholic High School, and I hate coming home to find a doe, or newborn kids in distress or worse. It’s easier on all of us if the does kid in late spring. This year was a great year with strong and healthy babies. 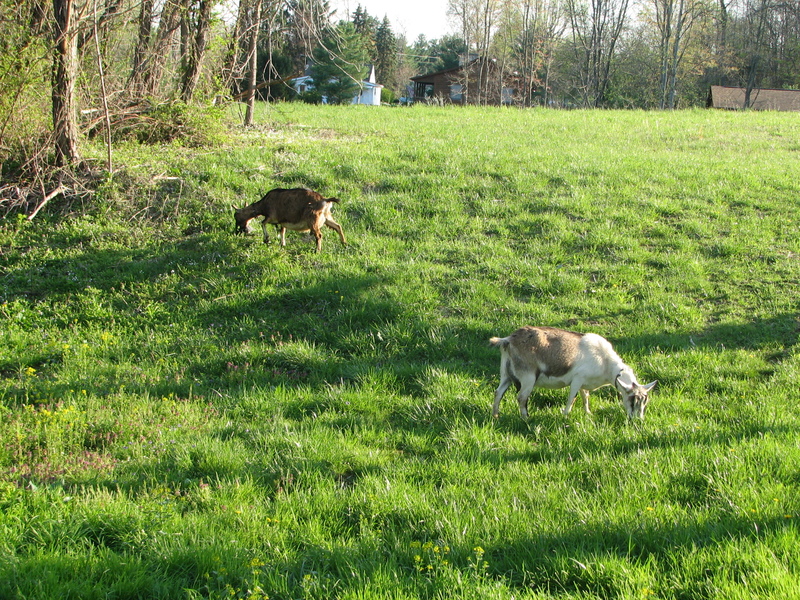 Having all does except 3 bucklings (male goat babies) made the kidding season a true success. Raising goats is one of my pleasures. They are dog-like in nature, don’t require nearly as much space as larger farm animals, can be taken care of and handled by children, and convert feed much better than their larger alternatives. There is a myth that goats eat anything. This is definitely not true, but they do a great job eating brush from woods and pastures. Goat favorites are brambles. The wild berry plants on my farm don’t produce an over abundance of fruit and they scratch arms and legs when trying to navigate through them. I am only too happy to share these woody, thorn laden stems with my goats. I prepare each year for the kidding season by stocking my medicine chest with latex disposable gloves, 7 % Iodine, colostrum powder, (or frozen colostrum stored in the freezer), and a high calorie nutrient drench just in case mom or babies need a quick pick-me-up. In recent years I added selenium gel to the regime. When newborn kids are discovered in the pasture, I slip on a pair of latex gloves and immediately dip the kid navels with a 7% Iodine solution. I use a container normally used to dip teats after milking to prevent udder infection, but it works great to dip the navel area, complete with body wall. Dipping the cord with iodine is a preventive measure that dries the cord quickly thereby preventing pathogens from entering the body through a moist cord. Dipped cords dry up in a matter of a day, and this helps prevent “naval ill” which potentially kills newborn kids. I use gloves because iodine stains skin and jewelry and it dries out my skin as well as kid navels. The accepted recommendation for feeding goat kids is to pasteurize the milk and then bottle-feed back to the kids. The reason for this is because there is a goat virus, caprine arthritic encephalitis (CAE) that causes a variety of afflictions to both newborns and adult goats. It is prevalent in American goat herds and can take years to show clinical signs. Heat treating colostrum and pasteurizing milk kills the virus. While the virus can be passed through any bodily fluids, taking this precaution with the milk may help prevent the disease. A responsible goat herder pulls the babies off the mother as soon as they are born and bottle feeds them till weaning. Weak kids require extra attention. If a weak kid is found is still wet, it needs to be dried off and warmed up quickly. A hair dryer can be used to warm kids but if they are really cold, they can be put in warm water to bring up body temperature, then dried quickly. A hot water bottle or two packed around a weak kid and a warm cover can make a big difference. Heat treated colostrum, selenium gel, and a high calorie nutritive drench should be given as soon as the kids body temperature goes up. Kids need to be kept warm if they are weak and sometimes a heat lamp is needed, or simply a trip to the house for a day or two. As with any other infant, kids need to be checked a few times a day to make sure they have not gotten into any kind of trouble. A healthy kid will be very active and alert. Kids under stress are lethargic and don’t feed well. 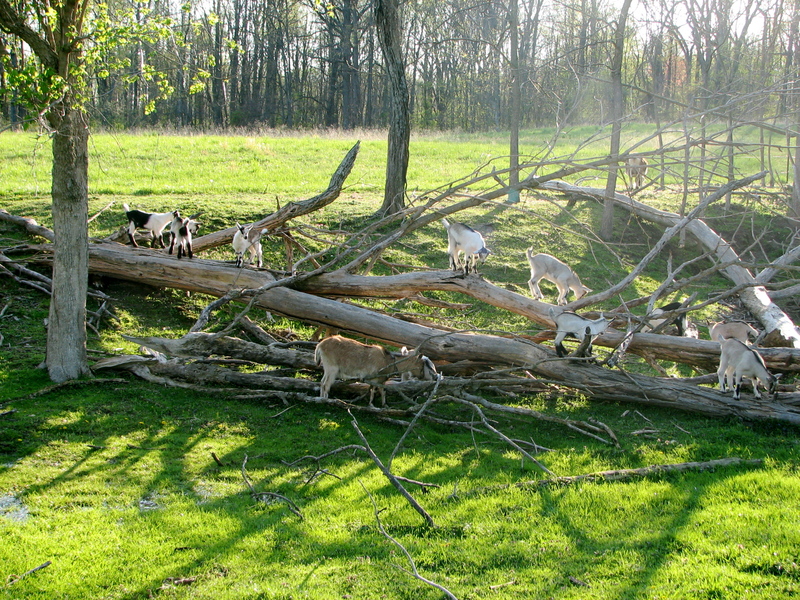 There is nothing better than coming home after a hard day at school and watch the goat kids “flock” around the goat pen; leaping on and off logs, or their mothers. They run from one end of the paddock to the other and back again until they tire and lie down to nap. Two of my girls greedily eating green grass! If you have further questions or comments please let me hear from you! This entry was posted in Animal Care and tagged goats, kidding. Bookmark the permalink.